Close to a classic Jewish deli, this place gets the bagel right along with other goodies. 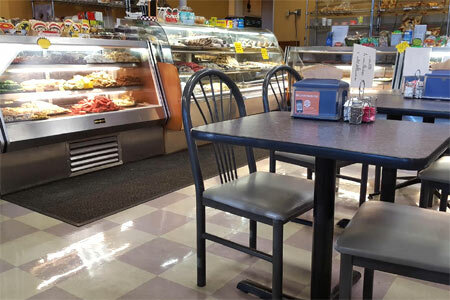 : Bagel Palace Deli & Bakery is a neighborhood stalwart with owners who moved here from New York decades ago. The draw is its freshly baked bagels and other breads and pastries that perfume the air. Add to that the whitefish salad and the cream cheese, both house-made, and you might think you've taken a plane ride north. What you've done, however, is stumble upon one of Atlanta's best bagel bakeries. Opening at 6:30 a.m., the place draws neighbors and passersby like a magnet. Prepare to wait for weekend breakfast. New York-style chopped chicken liver spread, baked salmon salad and similar delights are available, too. One Southern concession: Bagel Palace serves grits. This is a good spot for a late lunch, as the place shutters at 4 p.m. during the week and at 5 p.m. on the weekends.